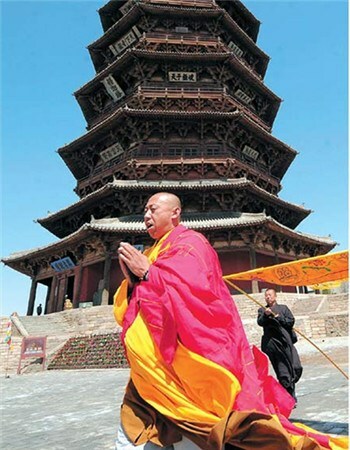 Shanxi Sakyamuni Wooden Pagoda attracts guests and pilgrims from near and far, but protecting it has proven difficult, as Francois Dubé finds out. In front of the Sakyamuni Wooden Pagoda, the fragrance of incense wafts gently through the air, while Chinese pilgrims prostrate themselves by lying face-down on the ground, showing the full extent of their dedication. Located in Shanxi province's Yingxian county, the pagoda is also named Yingxian Wooden Pagoda, and is the main tower of the Fogong Buddhist Temple. Thanks to its unparalleled architecture and precious relics, this unique wooden structure attracts believers from all over China. Visitors are initially impressed by the unique architecture of the wooden tower that was built during the Liao Dynasty (916-1125) in around 1056. At 67.31 meters high, the tower is the world's tallest wood structure, as certified by Guinness World Records. A stunning feature of the tower, and one which further contributes to its mysterious appeal, is the fact that it is made entirely out of wood - not a single nail was used during its construction. The octagonal pagoda has five interior and nine exterior floors, and each floor is sheltered by one tile eave, except for the first floor which has double eaves. The tower stands on a four-meter high stone foundation. The pagoda houses a 10-meter tall Buddha statue surrounded by paintings inspired by the Buddhist scriptures, and has become a place of pilgrimage for Buddhist pilgrims in Shanxi and across China. The Sakyamuni Wooden Pagoda is known to have survived several earthquakes and disasters since its construction. In a famous incident which took place in 1948, the communist People's Liberation Army fought the Kuomintang Army in a battle at the pagoda.